To assess the dietary inadequacies of micronutrients and the associated factors among the apparently healthy urban adults. This community-based cross-sectional study involved 300 urban adults (distributed into age groups: 21–40, 41–60, and > 60 years) residing in Hyderabad city, South India. Hemoglobin in whole blood, ferritin, folate, and vitamin B12 (B12) in plasma was estimated. Dietary intakes were assessed by three 24-h dietary recalls and calculated the probability of adequacy (PA) using estimated average requirement. The prevalence of anemia (30%), iron deficiency (ID, 23%), and iron deficiency anemia (IDA, 14.3%) was independent of age but higher in women. While folate deficiency (32.2%) was independent of age and gender, B12 deficiency (35.5%) varied by both age and gender. The PA of iron (89%) was higher, while that of folate, B12, and zinc (1–11%) were noticeably low. The mean PA (MPA) across the ten micronutrients was 38%, independent of age and gender, but associated with the educational status. Energy intake was a strong predictor of the MPA. Cereals and millets predominantly contributed to the intake of thiamine, niacin, zinc, and iron; green leafy vegetables and fruits to vitamins A, C, folate, and iron; animal foods to B12; and milk and milk products to calcium, vitamin A, riboflavin, and B12. 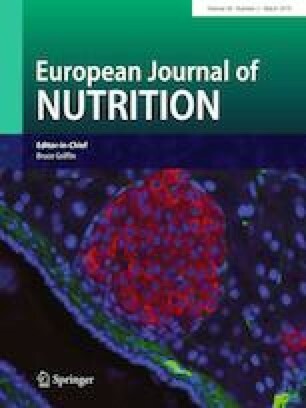 The unadjusted and adjusted logistic regression models revealed that micronutrient inadequacy was associated with greater risk of IDA and folate deficiency. These results indicate a higher prevalence of micronutrient deficiencies among the healthy urban adults possibly due to the inadequacy of multiple micronutrients. The online version of this article ( https://doi.org/10.1007/s00394-018-1859-y) contains supplementary material, which is available to authorized users. TS and MS received a research fellowship from the Indian Council of Medical Research, Government of India. The authors are thankful to all the subjects for their participation in this study. The help of Dr. P. Ravindranath, National Institute of Nutrition in the estimation of ferritin and C-reactive protein is greatly acknowledged. Conception and design: GBR and TS; data collection: TS and MS; data interpretation and analysis: GBR, TS, MS, NB, MSR, GM, BNK, and RP; preparation manuscript: TS, GBR, MS, and RP; and primary responsibility of the final content: GBR. All authors read and approved the final manuscript. GBR received Grants from the Department of Biotechnology, Government of India (Grant # BT/PR10658/PFN/20/806/2013) and Science and Engineering Research Board, Government of India (Grant # SB/S0/HS-192/2013).